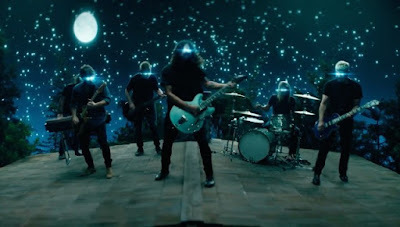 The Dave Grohl-directed clip sees the band performing the song and features the rocker’s two daughters, 11-year-old Violet and 8-year-old Harper. "One night I was lying out looking up at stars," recalls Grohl. "Just imagining all of these stars as places that have life on them as well, and I decided that the sky is a neighborhood, that we need to keep our s**t together in order to survive in this universe full of life. But I had no music yet. I just had the title. So every day I would walk around, kind of humming this thing in my head." In sync with the video’s release, the Foo Fighters are launching a constellation viewer, enabling users to transform to their phone into a tool for exploring the sky in their neighborhood. Using your phone, go to sky.foofighters.com to configure a realistic constellation map in the viewer's 3D sphere, then let it identify the constellations in your night sky accompanied by a Foo Fighters soundtrack. Grohl and drummer Taylor Hawkins premiered "The Sky Is A Neighborhood" with a live acoustic version in May, and the band delivered its full live debut during their June 16 performance at Iceland's Secret Solstice Festival. The Foo Fighters’ ninth album was co-produced by the band and Greg Kurstin (Adele, Kelly Clarkson, Sia) and mixed by Darrell Thorp (Beck, Radiohead). The group will launch the project with a fall US tour that will begin with their own Cal Jam 17 festival at Glen Helen Regional Park in San Bernardino, CA on October 7, which will feature more than a dozen acts, including Queens of the Stone Age, Cage The Elephant, Liam Gallagher, Royal Blood and more.